If private lessons are the interstate highway, then group classes are the state road that winds through the small towns alongside it. Both roads are taking you to the same destination, but the journey is very different. Decisions, decisions.Theoretically - theoretically - private music lessons are more effective than group classes. And theoretically, a child who starts piano lessons, say, at age four will be two years ahead of a child who starts at age six by the time they are both eight. But in reality, we are dealing with human beings. In reality, a child can sit through four years of lessons and achieve less than what another child will do in six weeks. And (lest this discussion be reduced to talent versus lack thereof), that first child can decide to turn things around and make up for the wasted four years with six weeks of concerted effort. The question that interests me is, Why? Let's get back to my pet metaphor. The Eisenhower Interstate System is designed for efficiency. It is supposed to get you from Point A to Point B as quickly and safely as possible - no distractions, no fluff. Likewise, when you enroll in private music lessons, you get an effective, focused approach to music education with an expert teacher. Fun is incidental to both pursuits, although that's not to say that highway driving (or private lessons) can't be enjoyable. 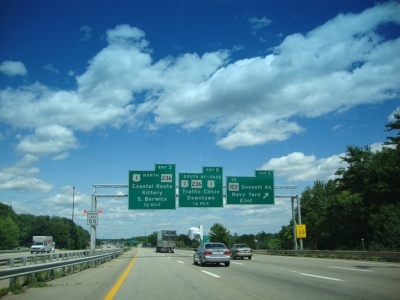 My hometown of York, Maine is accessed via Route 95 north from New Hampshire. Unfortunately, there is a toll booth a quarter-mile north of the exit that can get backed up pretty badly in the summertime, and there are few escape routes. Plan ahead further south and take Route One instead if you want to stop and get the best fried seafood ever at Bob's Clam Hut in Kittery, and then you can enjoy so much outlet shopping that you'll forget where you were going in the first place. Even better: Take Route 103, which winds along through Kittery and Kittery Point before finishing in York. In May, the chestnut trees are gorgeously in bloom. At the height of tourist season you will not encounter any traffic, and there are no stoplights. You can stop in at Fort McClary or the Wiggly Bridge, or just enjoy the gorgeous views of Spruce Creek, the York River, and the Atlantic Ocean beyond as you wind along the lovely country road. Less than fifteen minutes and you're in York, where you can hop back on the interstate if you feel like it. Theoretically the interstate is faster than the state road. Except when it's not. Except when there is rush hour, an accident, a ball game, tourist season, inclement weather, construction, or debris. Plus, you can't ride your bike, pick the wildflowers, or see much of anything. Most of the time, you take the interstate. All things being equal, you do the private lessons because that's what everyone does. But all things are not equal. For one thing, private lessons are two or three times the cost of group classes. They are much less flexible. It's difficult to hop in and out. If things aren't working, that's it - you're already at the top tier. With group classes, you can dabble. You can try different things, change it up. You can experience different teachers. You can have fun, and even study music solely for the purpose of having fun without alienating your teacher. You can collaborate with others. It's inherently social, which can make all the difference. Now, you can take Route One all the way from Kittery to Bar Harbor, but it will be a loooooooong trip and you'll never want to look at another fried clam stand. Once you have some momentum with group classes, private lessons become something special and valuable that can help you get to the next level. But it may take a child two or three years to get that momentum, and private lessons will not necessarily create it. May as well spend that time having fun and developing a love of playing, instead of stalling out. Go with your gut: Do you want the scenic route, or the expressway? No matter what twists and turns lay along the journey, you will learn to play as long as you just keep going.